EURUSD is under the influence of some economic news reports such as: ISM Manufacturing Prices, the Loan Officer Survey, Manufacturing PMI, Construction Spending m/m, ISM and Final Manufacturing PMI for USD and German Final Manufacturing PMI, the Final Manufacturing PMI, Italian Manufacturing PMI, and Spanish Manufacturing PMI for EUR. 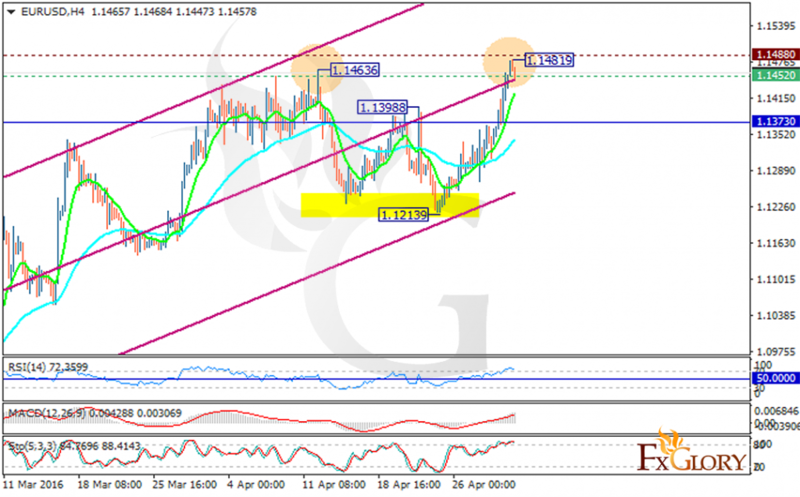 It seems that the consolidation pattern from 1.14636 has completed when the price hit 1.14819. Now the pair is finding support at 1.14520 with resistance at 1.14880 which both lines are above the weekly pivot point at 1.13730. The EMA of 10 is moving above the EMA 50 showing the price growth for the last recent days. All indicators are signaling buy opportunity such as MACD indicator which is in positive territory, the RSI is above the 50 level and the Stochastic is moving in high ranges. However the chart has already created a double bottom pattern which might lead to a reversal in near term bias. Unfortunately there is no clear signal for this pair at the moment, according to the indicators it might increase and reach 1.1550 otherwise after crossing the support line it will go lower completing double top and double bottom pattern.